Viewing topic "At last - an XS Arp Manager !!!" This is really good news - with this tool, XS (and XF) Arps will be a lot more usable. When will the new Arp Manager be available? This question has been on the forum for a week, with no replies (papaphoenix? Bad_Mister?) and hardly any reads, either. 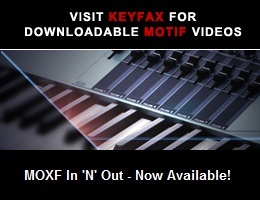 I hope that the new XS/XF Arp Manager is in the works, but there sure doesn’t seem to be much interest in Motif arps...??? Hi sorry i have miss this post, XS anf XF arp manager is on the road, i done the beta test for Julien with my Motif XS. But for the release date, only Julien can answer. This is great news.. will this also work with the S70XS?.. Hi, yes it will work also for S70/90 XS. ...any word yet on a release date for this new version of ARP Manager? Sorry i have no release date, i hope it will be soon now. Well i have the S70XS so i am excited to see this software!.. GREAT to hear, I want the new arp manager hope its soon .. For my Motif XS and Motif XF..
It’s been more than 5 months since Yamaha’s announcement of the XS/XF Arp Manager, and still no released product - is this ever going to happen? ??? I’m an ES user getting my XF delivered today and really want to see an XF version of ARP Manager...the ES version is fantastic and until I got it I found using the user arps supplied with various voice libraries too much of a PITA to bother with. I hope this will be released soon, I’m ready to buy it immediately. PS papaphoenix many thanks to both you and Julien for your work supporting the Motif community. ETA on the release date for the new ARP Manager? Just wanted to mention that John Melas’ Waveform Editor for the XS and XF now includes some arp pattern librarian features. It doesn’t support pattern editing the way Julien’s ES Arp Manager does but it’s still useful in the meantime. OK, it’s now been eight months, and no XS/XF/S90XS Arp Manager...it was in beta test last August, too...at this point, should we just assume that the project is dead and will never be released? Any comments, papaphoenix? Bad_Mister? ?? ?